The combination of the chocolate and powdered sugar were great, but I tasted little to no peanut butter. Overall, if you like the chocolate+banana combo, these are delicious! Combine the cream cheese, peanut butter and powdered sugar and mix on medium speed about 2 minutes. Fold in chopped chocolate chips. Cover the mixture and refrigerate (1-2 hours). Line a tray with a sheet of parchment paper. Melt chopped chocolate. Let the warm chocolate sit for 5 minutes to slightly cool before dipping. Line another tray with parchment paper and set aside. Using a fork or a toothpicks dip the cheesecake bites into chocolate to cover them completely and place onto parchment paper. You must work very quickly with the truffles and in small batches (take just 3-4 truffles from the freezer at the time). 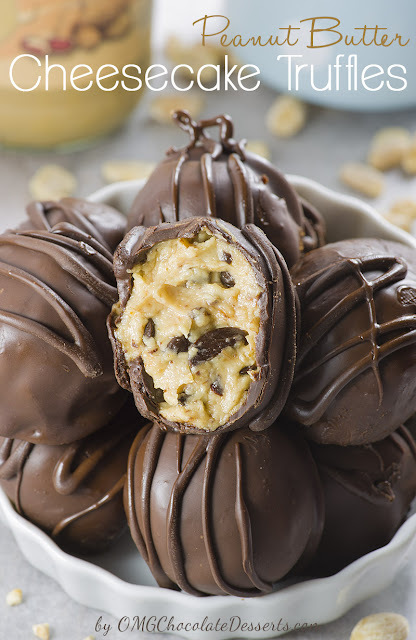 When the chocolate is harden, you can reheat the leftovers of the melted chocolate, transfer to a zip lock bag, cut the corner off and drizzled over the truffles.